Not much is known about Mr. Harlow, of Bridgewater, Massachusetts, but the products of his manufacture are of a high quality and exhibit a high degree of precision. No plane patents were ever filed or assigned to Harlow, but his name has been observed on a few planes as a maker of them. It's likely that Harlow was simply the manufacturer of others' ideas. 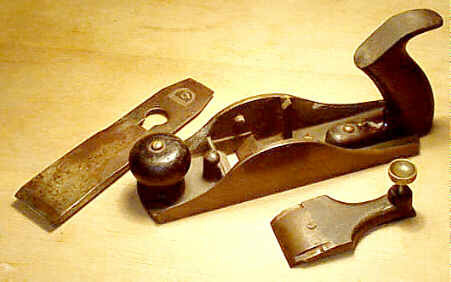 One such plane, the Phillips' Plough, is definitely a patented plane manufactured by him. Harlow stamped the planes he made with "C.C.HARLOW/BRIDGEWATER/MASS" on three separate lines. He worked during the 1860's and 1870's, at least. The plane illustrated here has no patent information at all on it, but does have Harlow's mark stamped on the left cheek down near the sole. This plane is the only known such example. Despite it not being patented, it's a very interesting tool, dreamed up by someone who must have thought there was a market for it otherwise he wouldn't have gone to the expense of making it so fine. There are no adjustment features at all on the plane. It's just a basic cast iron body, a knob, a tote, a lever cap, and an iron. However, it's the subtle details that are fascinating about this tool. The cheeks of the main casting are not uniform in thickness over their lengths. They taper toward the toe and heel from the thickest part at the arched area of the cheeks, for it's here that the most strength is required as it must bear the strain of holding the iron firmly in place. It seems likely that the cheeks are tapered to reduce the weight of the tool. At the strengthening crossrib, forward of the mouth, is a round boss cast integral to the rib. What its function is can only be guessed. Perhaps it was meant to accept an oiler, which could dispense oil to lubricate the plane's sole (don't laugh, oilers were patented and applied to early planes to save guys from having to rub parafin, or the like, on the sole). Maybe it was to be machined and tapped so that something could be added to close the mouth. Whatever its intent, it certainly has no use and is definitely this plane's appendix. The iron is held in place with a common thumb screw activated lever cap. It's surface, along the edges, ismilled to fit under two lugs each of which are fit into the arched portions of the cheeks. The lever cap has a strap of steel rivetted to the underside of the lever cap. It's on this strap that the thumb screw bears against as its tightened. 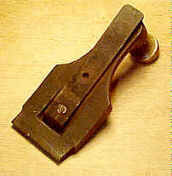 This strap might be thought to be extraneous since most lever caps that use the same principle don't have the strap, but it was probably provided to overcome the tendancy of the iron moving a hair latterally as it's apt to do when the lever cap screw bears directly on the iron. There are two interesting things about this plane, which deviate considerably from other planes. The first is its tote, which has no bolt or other means to secure the tote's heel to the heel of the casting (but it does have a small screw at the toe). Instead, the top of the tote is angled to the same degree as the iron is pitched. There is 1/8" space between the top of the tote and the rear of the iron. As the plane is pushed forward, the tote lifts away from the main casting a bit, and then butts against the iron's backside. A rather simple, economic, and certain way to overcome the common tote breakage that other means of securing the tote suffer. The second interesting thing about the plane is its sole. It has a concavity machined over the full length of the sole, but the iron is ground straight across. It seems that this was another attempt to decrease the tool's 'friction' on the wood's surface as it's planed. This design is ludicrous, as anyone familiar with the physics of planing knows, since there is no direct bearing surface on the wood ahead of the cutter, which is mandatory to reduce tearout. Whatever the inventor's intent for this was, it's certain that it would never catch on for it's concave sole alone. This plane is proof enough that you don't have to go through the expense to file a patent to make a useless object. Stupidity is free for all.